Whether you’re in college or you’re an adult trying to make it on your own, you’ve probably learned by now that roommates are a necessary evil. Perhaps they keep strange hours, don’t share your cleanliness standards or, worst of all, are the type of roommate that leaves passive aggressive notes around the house. Ugh. Whatever kind of bad roommate you’ve got, none could be worse than this student in Taiwan who called in local cops to investigate a yogurt theft. Yes, you’re reading that right. According to TVBS, the unnamed Petty Patty -- a student at the Chinese Culture University in Taipei -- ordered authorities to launch an investigation to determine which of her five female housemates snagged a bottle of yogurt she bought, ate it and threw it in the trash. Upon finding the bottle (a rookie mistake on the thief’s part, if we’re being honest), which retailed for less than $2, the woman confronted her roomies in the hopes of obtaining a confession. None of her housemates cracked during the impromptu interrogation, but she refused to back down. She marched down to the local police station and explained the situation to an officer who agreed to take a deep dive into the roommate drama. One local resident called the case “a waste of society’s resources,” but you’ve got to admit… you’re curious how it turned out, aren’t you? Police were unable to find fingerprints on the bottle, so they did the next best thing: asked the accuser and her five roommates to head down to the station so they could collect DNA samples. 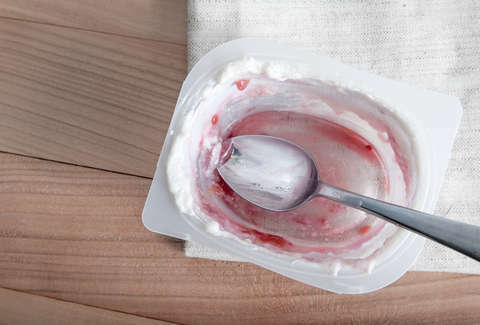 After more than $500 worth of genetic testing, police found their yogurt thief. As if this story wasn’t crazy enough already, the accused is now facing theft charges. We’re not sure if there’s a lesson to be learned here, but maybe now you’ll think twice before stealing your roommates snacks.